There is often a need to drill holes into the underside of concrete floors to allow false ceiling, pipework and services to be hung. Frequently precast hollow core floor beams need to be drilled to release water trapped in the cores. To drill these holes usually requires the operative to set up a tower scaffold, climb up it and drill the holes above their head. This process exposes the operator to potential falls, manual handling of scaffolding and the drilling is an arduous and repetitive task placing a strain on the shoulder. The operator is exposed to respirable crystalline silica fractions falling onto his face and clothes. Whilst drilling the holes, the operative is exposed to HAVS from the vibration of the drill and possibility of electric shock from the water coming out of the cores. The water in the cores mixes with the concrete dust forming a very high alkaline liquid. When weep hole drilling takes place this liquid sprays out over the drilling operative, often causing chemical burns and skin irritation. To overcome these issues, Beresford Flooring developed and patented 'The Hole System'. 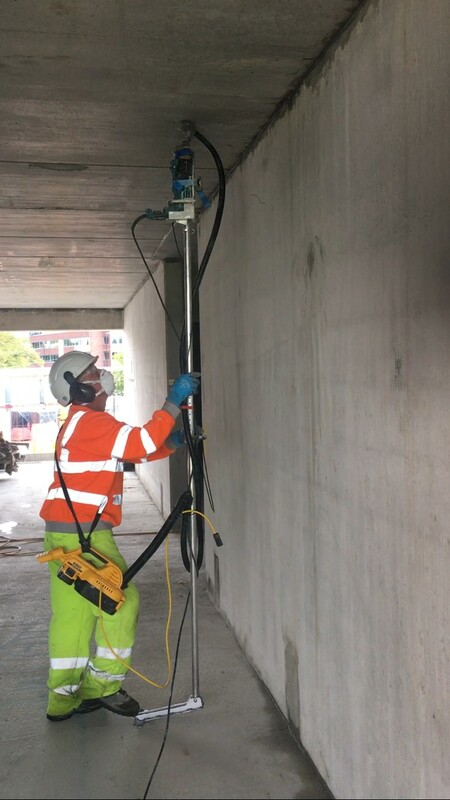 This system consists of a lightweight telescopic pole with a foot pedal cam and interchangeable heads for marking, drilling, raw plugging and filling holes, all from ground level. A hole can be drilled by placing a standard drill into the holder with in-built vacuum cup. The drill speed is controlled by a handle further down the pole. To drill a hole the operator lines the drill up to the pre-made pen mark, accelerates the drill by squeezing the handle located at waist height. The drill is raised upwards when the operative places his foot on the foot pedal cam. Any dust created by the drilling process is captured at source and directed into a vacuum cleaner. The pole can be adapted to enable an operator to mark up where holes need to be drilled or to insert raw plugs whilst working at ground level. Can be used in tight, hard to get places including stairs.